I wanted to share this cool old magazine cover. It's "Work and Win: An Interesting Weekly for Young America" from 1907, published by Frank Tousey. 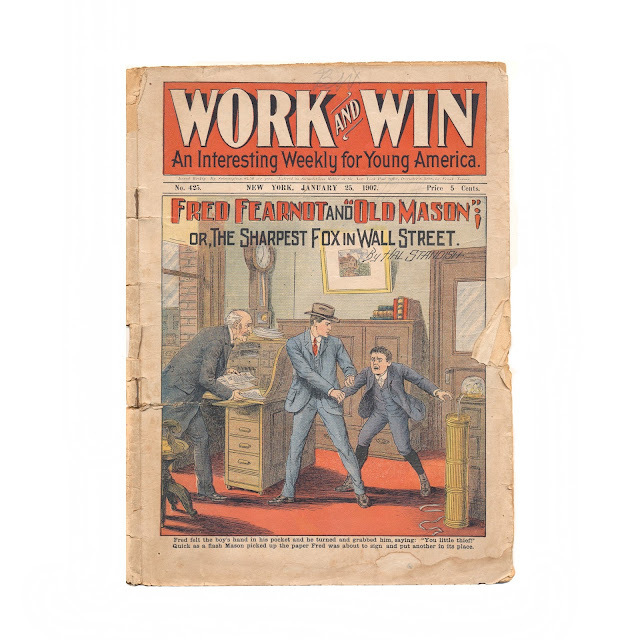 This issue is titled "Fred Fearnot and 'Old Mason' or, The Sharpest Fox on Wall Street." Such a great cover! Poor Fred, fallen amongst thieves. The story is told right there on the cover. But I don't doubt that Fred wins in the end. I love the cover. thanks for posting this one. There are plenty of "Work and Win" covers floating around the Internet. Fred's long career pitted him against jewel thieves, lynch mobs, secret societies, common bullies, swindlers, politicians, the demon rum and much more. He also fought in Cuba and Johannesburg, tangled with a "Boy Nihilist" in Russia, and returned to Yale to teach the college boys a thing or two. The Frank Merriwell covers are equally fun and footloose. Pluck and Luck, home of the Horatio Alger stories, was big on tales of young men Ruined by a glass of wine at a social club. I did a fiction piece where the 1920s hero was raised on Fred Fearnot. During a fire he recollected Fred Fearnot's approach to a dangerous rescue; I took the liberty of devising a spurious issue -- "Fred Fearnot, the Smoke-Eater" -- to serve the plot.